For many kids, making eye contact comes fairly naturally. For kids who are on the autism spectrum or for kids who lacked nurturing in the early years or have experienced early childhood trauma, eye contact is far from natural. Some kids find it uncomfortable while others can find it downright painful. 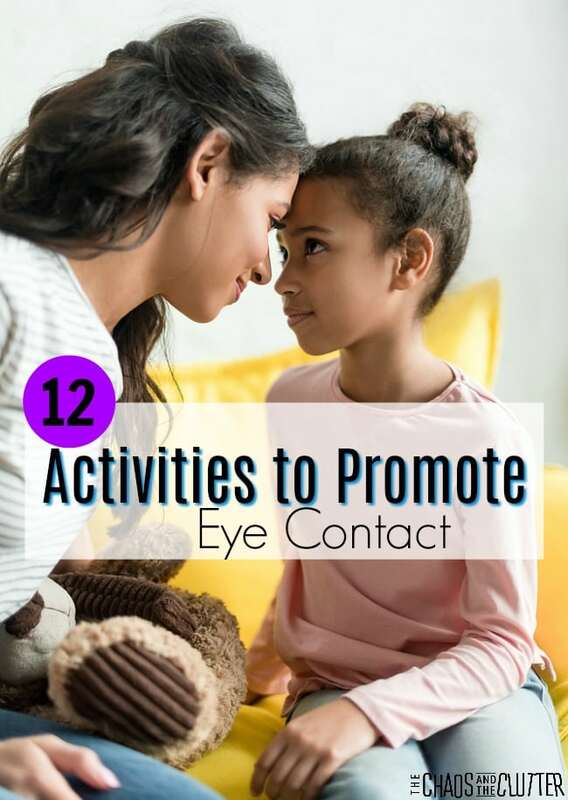 If your child struggles with eye contact due to RAD, autism, SPD, or FASD, there are some simple activities you can do that help promote eye contact in a non-threatening way. I want to share one comment before I get started with the activity ideas. It’s important not to say “look me in the eye” during these activities. 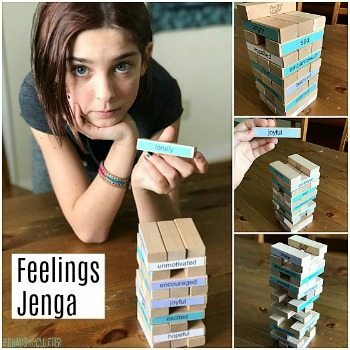 You are looking to foster natural connection and get your child comfortable with eye contact. You are wanting to get your child used to eye contact and build up their tolerance for it. 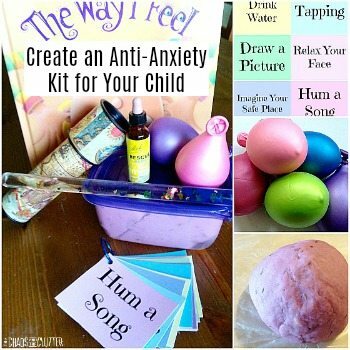 It is important not to increase their anxiety or make them feel like they are in trouble for not complying. I remember well the days when making eye contact was painful for one of our sons. It was hard to watch. It’s so much easier for him now, but it will likely never be as easy as it is for most people. But there has been tremendous process. I really believe that much of that progress was due to us repetitively doing many of these activities. Face painting – This is my favourite one. It is so subtle. While painting your child’s face, you will create natural proximity and be looking into each other’s faces. 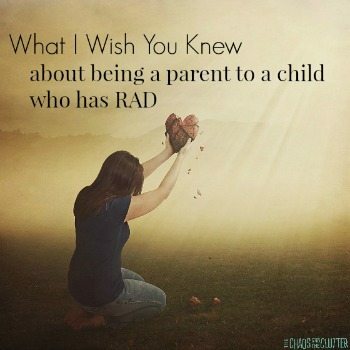 Try having them paint yours (that takes courage, but mama, I believe in you)! Be sure to use washable face paint. 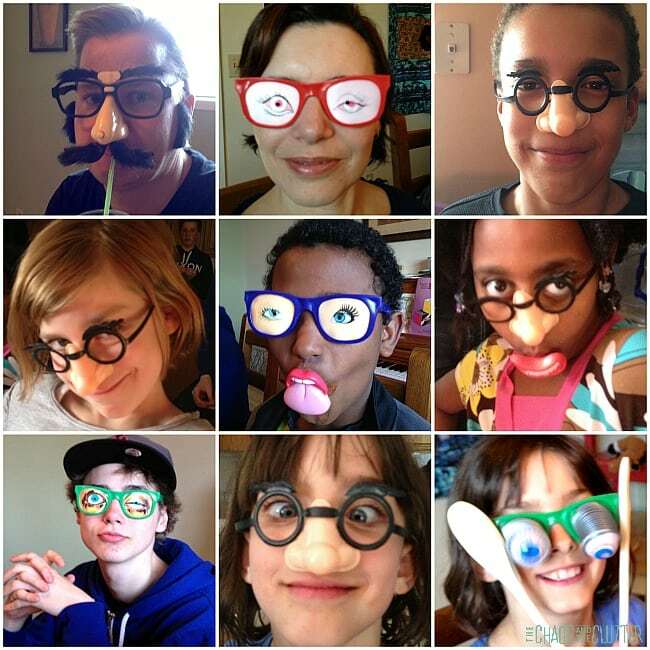 Silliness – Make funny faces or use silly getups such as clown noses, glasses with funny noses attached, or stick-on moustaches. Those pictures above are from a Family Fun Night we had. You better believe there was a lot of eye contact practise happening that night even if the kids had no idea there was a purpose beyond laughter! Stickers – Put stickers or googly eyes on your face. Gradually put them closer to your eyes. Peek-a-boo – Even with older kids, this game works. With older kids, you’ll have to infuse more silliness to get them to play along. Another way is to teach them to play peek-a-boo with a baby. Ask them to entertain a baby this way and they will be rewarded by smiles and squeals from the baby. Push them on a swing – Stand in front of them while pushing them on a swing. This encourages eye contact and is great vestibular sensory input. 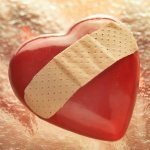 Secret handshake – Inventing a secret handshake with your child fosters connection and family identity. It also encourages eye contact. Major bonus points if your secret handshake ends with your foreheads touching! Butterfly kisses and Smurf kisses – Butterfly kisses are when you touch your eyelashes together and blink quickly like butterfly wings flapping. Smurf kisses are when you rub noses. These will obviously be too vulnerable for kids who are at heightened stages of their attachment journey (?). Board games – Connect 4 is the best one for this if you sit on opposite sides of the board. Because of the level of the board, accidental eye contact is inevitable! Bubble gum – This is a trick I learned from the late great Karyn Purvis. Bubble gum is good sensory feedback both for proprioception and gustatory (taste). Keep hoards of bubble gum in your child’s favourite flavour. To get a piece of gum, all they have to do is ask “may I please have some gum?” with some degree of eye contact and the answer is always “yes”. Count freckles – If your child has freckles on their face, count them and assign names to them. Or have them count and name yours. There’s bound to be some eye contact here and there. Play an eye signal game – Have your child stand a few feet in front of you (or closer if they’ll allow). Signal to them with only your eyes to move to the side (by looking to that side), the other side, stepping back (eyes up), or taking a step forward (one blink).